RAMMASUN is transforming into a temperate cyclone. At 08 HKT, RAMMASUN was situated about 480 km (260 NM) SSE of Tokyo. RAMMASUN will maintain its northeasterly movement along the northwest periphery of the subtropical ridge in the rest of the forecast period. RAMMASUN will fully turn into an extratropical cyclone in 12 hours' time. This is the final bulletin on RAMMASUN. 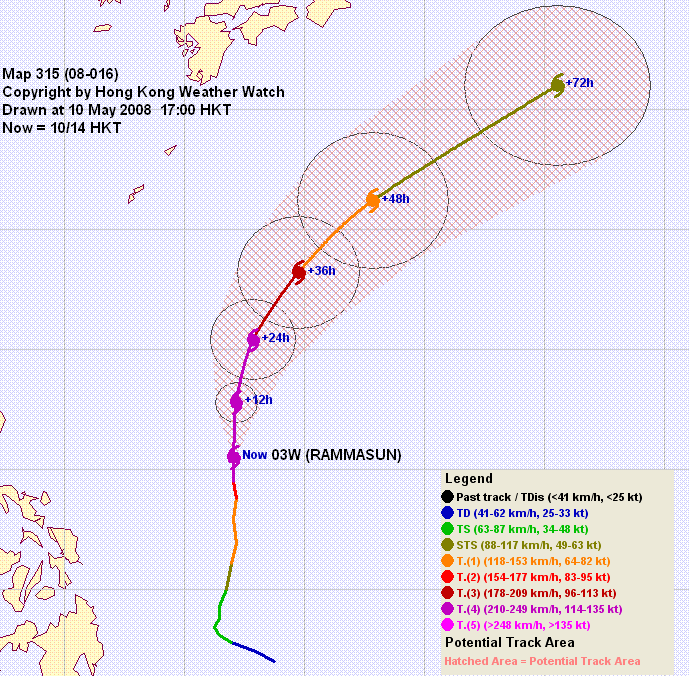 RAMMASUN has turned to a northeasterly track and is gradually weakening. 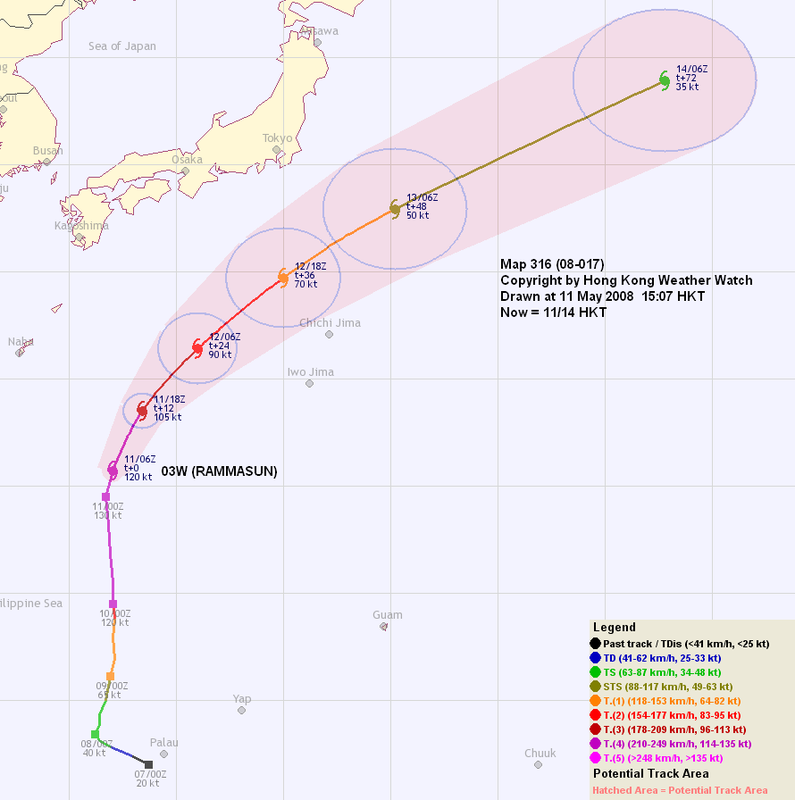 At 14 HKT, RAMMASUN was situated about 630 km (340 NM) WNW of Iwo Jima. RAMMASUN will turn into an extratropical cyclone in 24 to 36 hours' time. 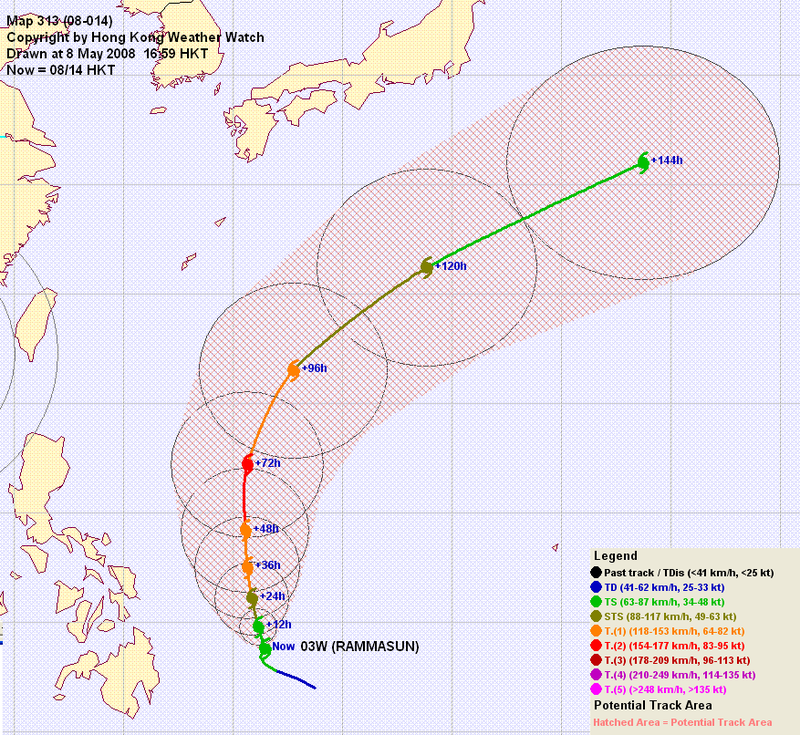 RAMMASUN intensified slightly last night, making it a super typhoon with wind speed of 135 knots. 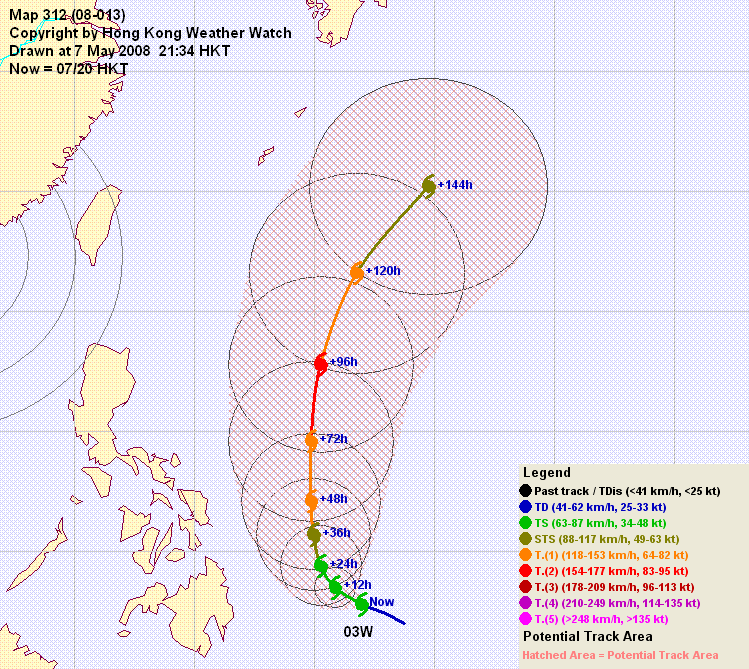 It has weakened since then and is now a category 4 typhoon. 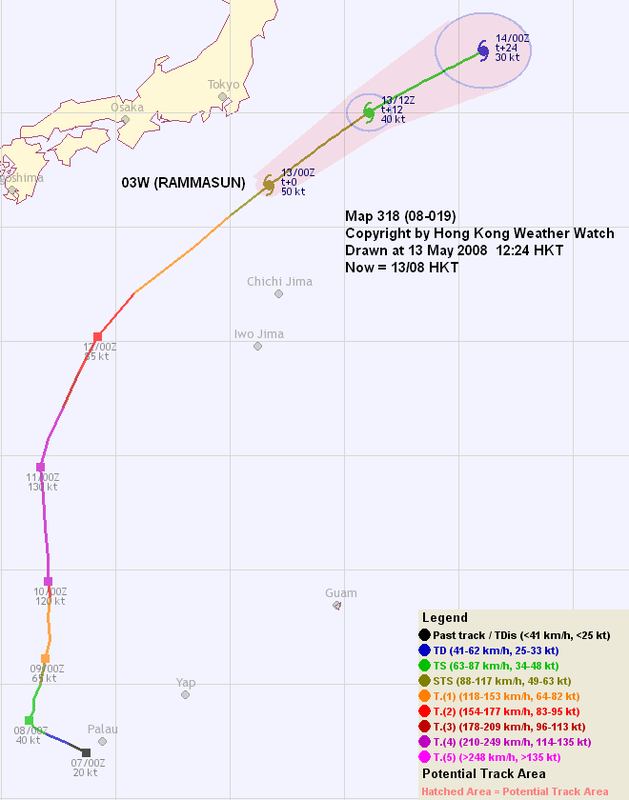 At 14 HKT, RAMMASUN was situated about 1030 km (560 NM) WSW of Iwo Jima. RAMMASUN is about to turn NE as it crosses the ridge axis. It will maintain its northeasterly movement along the northwest periphery of the subtropical ridge in the rest of the forecast period. Wind shear will strengthen as RAMMASUN is subject to the westerlies. Coupled with lower sea surface temperatures and entrainment of drier air RAMMASUN will weaken and will start extratropical transition in a baroclinic environment. RAMMASUN intensified rapidly last night and a round, symmetric eye is developed. At 14 HKT, RAMMASUN was situated about 1370 km (740 NM) SW of Iwo Jima. RAMMASUN is now tracking along the weakness in the subtropical ridge induced by an arriving mid-latitude trough. It is expected that RAMMASUN will accelerate and turn NE once it crosses the ridge axis at around 20N. There is virtually no vertical wind shear at where RAMMASUN is situated. Also, as the sea surface temperature at where RAMMASUN is located is very suitable for storm strengthening and the poleward outflow channels keep improving due to the trough that deepens the weakness in the subtropical ridge, it is expected that RAMMASUN can maintain strength or even strengthen a bit before recurvature. Extratropical transition is expected in extended forecast period. RAMMASUN's large area of convection consolidated today and a banding eye is developing. 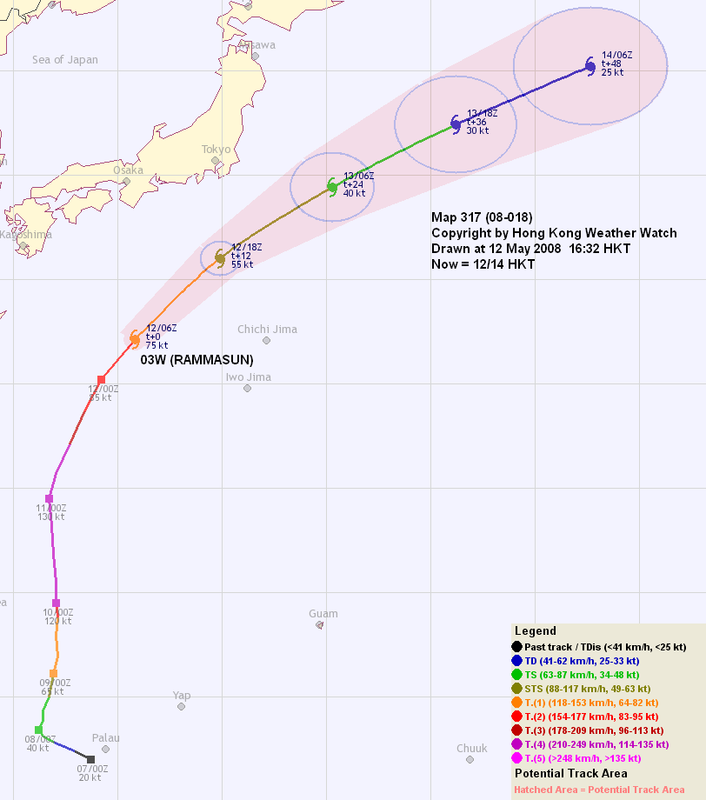 The storm also reached typhoon status earlier today. At 14 HKT, RAMMASUN was situated about 710 km (380 NM) WNW of Yap. As the sea surface temperature at where RAMMASUN is located is very suitable for storm strengthening and the poleward outflow channels keep improving due to the trough that deepens the weakness in the subtropical ridge, it is expected that RAMMASUN can intensify further into a category 3 typhoon later. Extratropical transition is expected in extended forecast period. 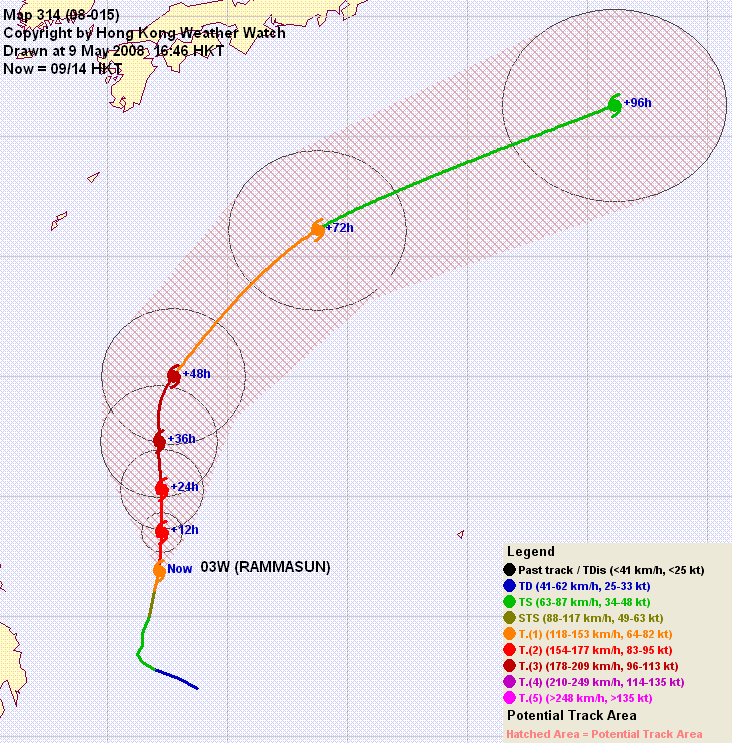 JMA upgraded 03W to tropical storm status today and named it RAMMASUN. At 14 HKT, RAMMASUN was situated about 740 km (400 NM) W of Yap. RAMMASUN has started its poleward turn earlier than forecast, and from steering charts the weakness in the subtropical ridge has widened. It is expected that the ridge will retreat further to the east and allow RAMMASUN to move poleward in the first half of the forecast period, after which it will encounter the westerlies and gradually turn northeastward towards the seas southeast of Japan. As the sea surface temperature at where RAMMASUN is located is very suitable for storm strengthening (near 30 degrees) and the poleward outflow channels keep improving due to the trough that deepens the weakness in the subtropical ridge, it is expected that RAMMASUN can gradually attain typhoon strength as it travels northwards. Extratropical transition is expected in extended forecast period. The disturbance 94W has strengthened into a tropical depression earlier today, and is now a tropical storm. JTWC has given it a temporary number of 03W. At 20 HKT, 03W was situated about 700 km (380 NM) WSW of Yap. The subtropical ridge to the north of 03W has developed a weakness directly above the system. It is expected that the ridge will retreat further to the east and allow 03W to move poleward in the first half of the forecast period. Currently the extended forecast calls for a recurvature along the northwestern periphery of the retreated ridge, which is the scenario predicted by most numerical forecast models. As the sea surface temperature at where 03W is located is very suitable for storm strengthening (near 30 degrees), it is expected that 03W can gradually attain typhoon strength as it travels northwards.